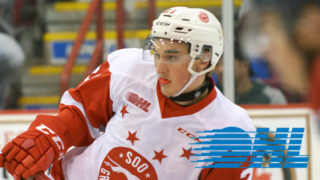 NHL Central Scouting released it’s November “Players to Watch” list earlier today and the latest rankings have a distinct Soo Greyhounds flavour. The current West Division leaders share the lead among Ontario Hockey League clubs with four players represented; JACOB LEGUERRIER, COLE MACKAY, JOE CARROL and CULLEN MCLEAN. MacKay and McLean join the list after both Carroll and LeGuerrier appeared in last month’s edition of the rankings. 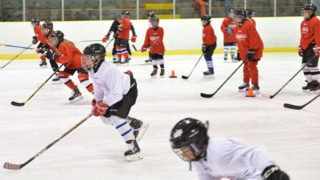 CARROLL (B-Prospect) is also in his second season with the Hounds. Originally selected in the 4th Round of the 2017 OHL Priority Selection, Joe has 3 goals and 4 assists so far in the red and white. 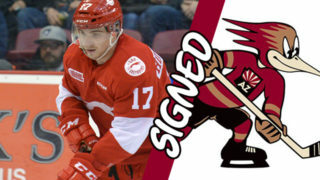 LEGUERRIER (B-Prospect), a native of Gloucester ON is in his third season with the Greyhounds. Originally selected in the 8th Round of the 2016 OHL Priority Selection, Jacob has appeared in all twenty-one games played by the Hounds so far this season while producing one of the team’s top +/- ratings with +5. 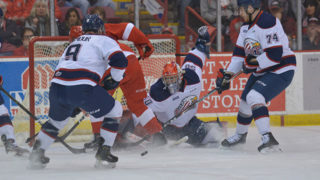 Cole MacKay of the Sault Ste. Marie Grehounds. Photo by Terry Wilson / OHL Images. MACKAY (C-Prospect), a hometown product, is top 3 on team scoring while already surpassing his rookie season point totals from one year ago with 7 goals and 14 points in 21 games played. He was selected in the 5th Round of the 2017 OHL Priority Selection with the Hounds. MCLEAN (C-Prospect), the team’s 15th Round Selection in the 2017 OHL Priority Selection is in his rookie season with the Hounds. Through 21 games played, the Brooklin ON product has 3 goals and 5 assists. 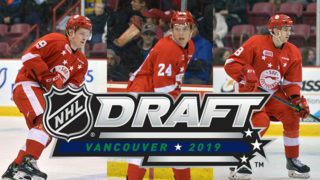 The foursome of Greyhounds are among forty-seven (47) players from the OHL listed this month in advance of the 2019 NHL Draft to be held in Vancouver, BC on June 21-22, 2019. 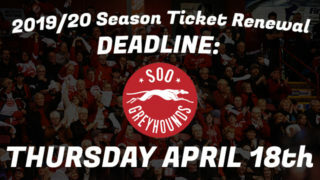 To view the complete release produced by the Ontario Hockey League CLICK HERE. • Seventeen players have been drafted to the NHL out of the Greyhounds program over the past five years. To view the full listing CLICK HERE.